Digital space is also a social space so we have to use the proximity variables to design platforms and communities with collaborative objectives. A few years ago, Isaac Kohane, a researcher at Harvard Medical School, published a study that looked at scientific research conducted by groups in an attempt to determine the effect that physical proximity had on the quality of the research. He analyzed more than thirty-five thousand peer-reviewed papers, mapping the precise location of co-authors. Then he assessed the quality of the research by counting the number of subsequent citations. The task, Kohane says, took a “small army of undergraduates” eighteen months to complete. Once the data was amassed, the correlation became clear: when coauthors were closer together, their papers tended to be of significantly higher quality. The best research was consistently produced when scientists were working within ten metres of each other; the least cited papers tended to emerge from collaborators who were a kilometre or more apart. “If you want people to work together effectively, these findings reinforce the need to create architectures that support frequent, physical, spontaneous interactions,” Kohane says. “Even in the era of big science, when researchers spend so much time on the Internet, it’s still so important to create intimate space. Design the physical space, the rooms where we work all days it’s an important factor for complete project of User Experience Design in Social Business. I don’t know if Ratti knows the enactive cogniction but senses and responds it’s similar the basic loop of all cognition in life. Understanding this process it’s fundamental for many kind of design. For example, the A.I. approach of Rodney Brooks – MIT and iRobot – is enactive, embodied as you can read in his papers. If you understand this deep cognitive processes you can design a better interaction in architecture, user experience or A.I.. In this third post I’m going to explain the principal processes that express the differential value of my approach. b) persuasive design of apps and networks that combine intrinsic incentives (Relational Motivations), with triggers. To build a community is to trigger a complex system, to build a group with its rules, codes, values, practices (see the continuum explained in the first post). So, from the first moment, an Enterprise 2.0 project is also a Change Management consultancy. In the next post I’ll explain the role of minimal change of the organizational culture that is necessary to trigger the behaviors of the users. So, how to achieve these objectives? I’m asking you to do a continuous mental shift between complementary levels and opposite concepts (see Edgar Morin), to be dialogic, a double logic. It become a hybrid approach between the community of users and the group of professionals, between professionals and persons, between cognitive interaction and social interaction both with knowledge management objectives. Let’s see the principal processes. The relation between community and group in a physical organization space can be the first advantage to know and to use. The Social Presence is a process that expresses the extension of our social dynamics in a mediated interaction. In other words, when you feel that there is continuity between your social life in physical place and also in digital place that is the product of the Social Presence. – Less processes: and less consultancy companies to nudge adoption and learning behaviors, because the user experience on the interface of collaborative apps, of a network becomes a place where there is a concrete convergence of cognitive and social processes in the users. The economy of processes isn’t only about the convergence of adoption and learning but also about the interaction with the technology and the collaborative interaction with the colleagues. – More persuasive channels: with the persuasive level of the design we have a more opportunity to persuade constructive behaviors of professional as users. Generally the companies don’t consider the person part of their employees but only the professional part. But we know that when a professional is working don’t finish to be a person, so the traditional organization culture crate by itself, by an implicit way a unknown land of knowledge, relations, conflict, motivations, ecc.. The vantage is to make an alliance between professional and person. – the principal kind of motivations that nudge collaborative behaviors that are the bases of many knowledge management practices. To do this alliance is necessary a internal campaign of communication and influence the design too. There is a relation between professional and person with the explicit and an implicit organization (see Knowledge Management and Organizational Psychology). It’s important to remember this relations because the implicit organization could influence not only the users, the employees but the consultants too. I’ll talk about it in the next post. We can have some users, some employees that adopt and learn new technology and good practices but how they can influence their colleagues, their friends in the network, to do the same? – during the cycle of evolution of the community the leaders are the capacity ti improve or stop collective behavior. The subject of leadership can be not only individual users, persons but groups too that they move as an entity. How can leadership influence others? By bottom-up legitimation that increase reputation. So it’s important to design implicit processes that help the emerging of leadership and manage this dynamic. – content that produce a strong emotional impact like several viral videos on youtube. If the leadership is generally more relevant in the design level of persuasion the contents are relevant in internal communication campaign. In the virality process is important to use social network analysis to check what’s going on in the network. In the next post I’m going to show the principal operative phases of consulting. In the first post I introduced the principal levels and variables characterizing an Enterprise 2.0 project. From my integrated point of view we can identify four frequent setup errors present in several Enterprise 2.0 approaches. The users in a company don’t make a free choice when they adopt a new app and collaborative practies, like what happens in the open web. So it’s necessary a strategy of engagement. Objectives and the ecosystem of a network in a company are different from a social network in the web. This means different users, differents behaviours, different incentives, different strategies from the web. In the last fifteen years many companies had thought that is enough to have a good IT, a good technology, to achieve several knowledge management objectives. But opening a channel isn’t enough to make people participate. In fact, the knowledge management processes and practices have a relational origin in the organizational culture. With a technocentric point of view, IT only extends the cognitive processes inside the knowledge management processes of the organisation. So, the risk is to have the potentiated capacity of communication, collaboration but not used or partially used. You have to work both on technology and organisational culture at the same time. When consultants or designers talk about top-down processes in a social network or intranet, generally they mean the hierarchic direction, from the top to the bottom of contents, information organisation and the strategy of governance of the community. But top-down can be also the motivational strategy and the typology of incentives. It’s fundamental moving from estrinsic to intrinsic motivations because intrinsic incentives are the best to nudge collaborative behaviours. If you want active users, don’t use only a TV or bingo incentive metaphor that makes them passive. It’s not a matter of faith in the bottom-up organisation. The logic between top-down and bottom-up is inclusive, not esclusive. The point is to understand that auto-organizations of behaviours and informations (meme) is related to more engagement of the user and the evolution of the community. The knowledge management objectives are a challenge to the decisional capacity and coordination of several parts of a big company. An Enterprise 2.0 project could create hierarchic and conflictual resistence inside the structure of the organization. The complexity is also present in the different competences required to understand and manage all the different levels. Generally this situation produce the request that a partial approach can be “magical” enough, or that the company need only a design solution because they have clear the strategic point of view. Unfortunatly the difficulty to deal this complex and multilevel scenario produced a big loss of time and money for the many companies. Don’t worry, it’s normal. It’s physilogically difficult for a big company organised an important internal coordination for a transversal project as a project of Enterprise 2.0. It’s also normal that there is always someone ready to collude with this partial request. The correct way is that from the first moment an Enterprise 2.0 project is Change Management and is fundamental to not collude with this partial request, but help the company to coordinate and understand itself to produce solid start point. In the next post I’ll introduce the main processes of my approach to Enterprise 2.0. This is the first of a four post introduction to a new approach to the Enterprise 2.0 concept. To start, I’m going to show you the basic concepts and the fundamental conditions you need to understand the specific variables, the levels and the competencies of a E2.0 project. – PSIxD is the acronim of Psychology applied to Interaction Design, a field I’m working on since several years ago, check for example the syntesis of the methodology I created with Davide Casali. PSIxD is an important differentiation point from a big part of Enterprise 2.0 approaches that you can find around the world. It’s an expression of the changing of users and the co-evolution between human and cognitive artefacts. It’s a scientific and serious modality to analyse the impact of that darwinian natural selection of technologies, apps and practices that is the web and the mobile. We had seen to much speculations on Web 2.0. What are in synthesis the concepts you have to know? So, in other words, the interaction is even more a virtual space, a middle ground where you can represent and manipulate mental, social and motivational dynamics of users. In an Enterprise 2.0 scenario PSIxD is a methodology of Persuasive Design that improves the probability to nudge the user to take or break several behaviours. – Hybrid is the mix of competence, theories and tools you need to approach all levels present in Enterprise 2.0 project. Too many models of Enterprise 2.0 are too limited on a few competences and points of view. The competence have to be transdisciplinary because the object of consult and design is a complex system. We have two principal objects, users and organization. 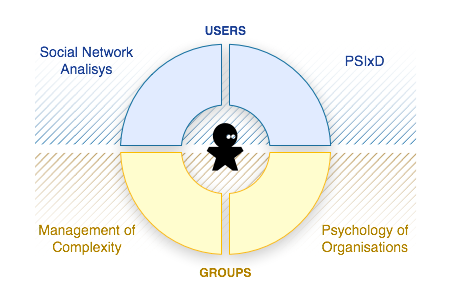 The user in a social network is on a continuum between a complex system and a psychological and social system. You can see in this image the hybrid competencies that are necessery to manage a Enterprise 2.0 project. In the next post I’ll talk about the most frequentily mistakes in Enterprise 2.0.